Innkeepers Nana Simopoulos and Caryn Heilman transformed a derelict downtown building into an eco-friendly marvel, with solar panels, biofuel heating, and natural clay walls. Bedding and linens are made from organic cotton, and guest rooms are decorated with colorful themes ranging from Ancient Greece to Morocco. The owners host green workshops where you can learn about environmentally friendly cooking and cleaning. Each of the seven rooms is hand painted by local artists and contain vibrant murals, organic bedding, and lots of space to unwind. YOU SHOULD KNOW The inn is spotless and innkeepers do everything possible to keep out anything like residual pesticide from the outside. To do this, they ask you to remove your shoes (slippers provided) or use shoe coverings in the house. Rooms with spa tubs feature chromatherapy lights for a relaxing glow, while rain showers emit aromatherapy steam. All rooms are stocked with organic bath products. YOU SHOULD KNOW The innkeepers request that you use only the organic, fragrance-free bath and beauty products provided during your stay. The common area and dining room have chairs and tables (a mix of modern with antique-style wooden chairs) but there's no lounge area or overstuffed sofa. On nice days and evenings, take a glass of tea out to the porch and relax on the rockers. Breakfast is served each morning in the dining room. Expect rustic bread, fresh fruit, and homecooked entrees as part of the two-course organic breakfast. There's also a selection of organic and fair-trade coffee and tea. There's no bar in the B&B; ask for nearby recommendations. A car is required to navigate the towns and outdoor sights around the Berkshires. For coffee, vegetarian snacks, and heralded salads in a modern cafe setting, head to the Coffee Liberation Front (5-minute walk). The Gramercy Bistro at MASS MoCA (15-minute drive) is just as stylish and hip as the museum, serving updated American and French classics, creative drinks, and Sunday brunch. Looking for authentic Austrian? the Haflinger Haus (5-minute walk) prepares meat-heavy, and some seasonal dishes in old world style. Public eat + drink (15-minute drive) is an industrial chic spot, and a favorite with MASS MoCA visitors, for American comfort food along with a long list of craft beer and cocktails. The Purple Pub (20-minute drive) offers pints and late night bar eats in a laid-back, New England pub setting. 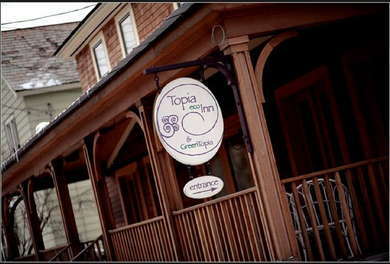 The eco-friendly environment is not for everyone, but those who want a peaceful and organic retreat alongside like-minded travelers will find the Topia Inn a sanctuary.